Beans. Versatile thing, beans. I grow a lot of them, both in variety and quantity. We usually put away about 20-30 pounds of dried beans a year, and eat the green ones fresh as they come in. And shell beans still remain my favorite thing out of the garden. It’s fair to say I am crazy about beans. For all I grow, there are others I do not: lentils remain the prime example of pantry staples NOT from my gardens. Chickpeas too. Everything else, though: we eat about one dinner a week where beans are the primary part of the meal. Chili, baked, burgers, falafel, and soupsoupsoup! Warm lentils on cold salad, potted beans and chicken (rillettes, basically) on toast. Pasta e fagioli. We loves our beans. Beans and more beans. Might as well make a couple of pots of them. But it’s only once during winter I make the dish that is the Queen of Beans. And I made it this weekend for friends. Cassoulet. This one humble bean dish (for that is what it is: a dish of beans) has, etymologically at least, spawned the equally humble casserole, which, at least for us Americans, leaves a bit of a nostalgic tang in our mouths. Yes, indeed: the hot dish of Minnesota/the Dakotas and parts of Wisconsin and the casserole of all other points south have this one singular bean dish to thank for spawning the cream-of-mushroom, potato-chip-topped “casseroles” served on many dinner tables, church basement events, and potlucks. Can I say there’s hardly anything left to compare these two dishes other than their names? It’s true. One is a stew, one is a baked item. Both, though, find their origin in inexpensive, humble ingredients. You’ll probably not find a recipe, say, for truffle casserole. I am incorrect in calling it “one singular bean dish.” Wars I am sure have been fought over less than the true recipe for cassoulet. Let us just say that the ancient southwestern French dish of this name is a bean stew baked in a cassole, which is a conical ceramic bowl with a base half the diameter of its rim, and a height that is about three quarters of its rim. (Does that description make sense? I will simply say it’s baked in a very pretty bowl that gives it a lot of surface area to give it a nice, crisp, crumbly top.) It is a bean dish that is normally cooked with preserved and fresh meats (typically, but again, not always, duck confit and simple fresh pork sausage). 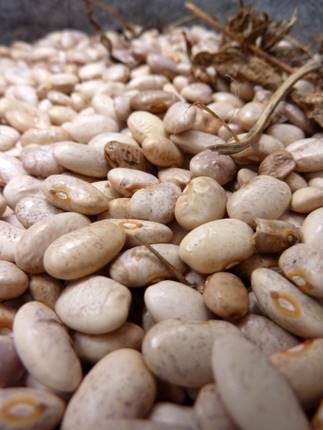 The beans however are a constant: they’re a very large white haricot bean called the tarbais. I am trying to find a source in the US: anyone? If you’ve read me long enough or if you know me personally, you’ll know I am a cheapskate who’s prone to going to extreme lengths to make things herself. And making this wasn’t hard, just slightly time-consuming. I used my own goose, beans, spices and veg. I found local pork and pork sausage. In other words, it was peasant in spirit, as I was the land peasant who grew the goods, and my friend the potter threw the cassole. And leftover cassoulet? What leftover cassoulet? 20-30 pounds of dried beans per year? Nice. I’ve never made cassoulet. For some reason it wasn’t covered in culinary school, when so many other French dishes were. Go figure. But I did just put up my first iteration of one of the ingredients – duck confit. Not my own duck, sadly. But locally sourced from a grass-based farm. It’s supposed to sit for two weeks before sampling, so I’m patiently waiting. I’ll think about a batch of cassoulet if all the confit doesn’t get horked down more or less on its own. Hey! The snowflakes are back on your page! Must be that time of the year. I’m going to have to try and find this place one of these days as it is not too far from where we live and it sounds like they do grow their own beans. I wonder if the bean is something that we could grow in our garden or if the number of days is too long. I’ll have to check it out, it sounds like an interesting bean. My wife loves to make beans dishes so I’m sure your cassoulet will really be of interest to her. Do go see, Mike! And send me a few beans to try 🙂 I can only imagine they can’t be hard to grow if Purcell Mountain grows them…I know they’re rare-ish because they need to be hand-harvested. Anyway, it would be a nice addition to the garden, I think. I mean, I can get a pound from Amazon for eating but that might not be the same thing, or they might not grow as well. I adore cassoulet and was actually planning to make it this week. It’s so warm and comforting. Enjoy all your wonderful beans. This is the conundrum of us tiny backyard urban gardeners. 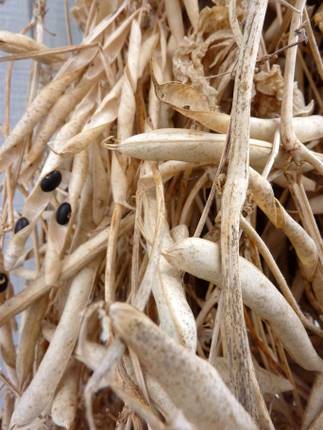 Quantity vs. variety…my one 9 ft. teepee gave me about a pint of Good Mother Stallard beans. And near by, a small patch of corn gave me about 2 cups of gorgeous pink cornmeal. I probably should have just forgone the real estate for the corn and planted another teepee or two. And of course it’s a lot of space devoted to plants you aren’t going to harvest until they are dead and ugly. I’m still working on efficiency of space. My dream garden is one where I don’t have to make the choice, where I get more than a meal or two of what I love. So how many plants per variety of the dried beans do you plant? Also, YUM! Were those baked in the Loven? El, hope you don’t mind me jumping in to reply to Heidi – but I hear you about the tiny urban garden. Even though the yield is low, I love growing beans for drying because they require so little attention through the summer. Have your tried a Three Sisters planting? Pole beans grow up around the corn stalks (and help feed the corn), squash vines wend their way throughout to shade the ground. Squash vine borers are rampant here so I mostly stick to Waltham Butternut, which is supposed to have tough stems. Karen, thanks! Yes, I have tried a 3-sisters planting. This year it was bush beans in with the corn, with the squash (labeled bush-type, but grew up to 25′!) trailing throughout. I’ve never had success growing pole beans on my corn, though like El says below, I haven’t tried one of the southern types. There’s always next summer! Shell beans have become my ultimate favorite. And I like dried beans, but green not so much any more. I’m getting lazy, I think. That’s a whole lot of beans. My understanding of cassoulet is that the French fight over the correct recipe and that there are as many recipes for it as there are cheeses in France. I’ve never tried it though. Thanks for the definition of shell beans; I’ve been wondering about that for awhile. Oh cassoulet! My very favorite winter dish to be sure! I am no purist when it comes to food (well, maybe dark chocolate). I believe cassoulet especially is wiiiide open to throwing in whatever one has on hand, as long as beans are involved. My favorite combination is chicken, Polish kielbasa (real deal stuff), and any kind of white bean that gets creamy when cooked. How many square feet of beans do you plant to get 30 pounds of dried beans? I got one quart jar this year from a 50sf patch…not nearly enough to feed my habit! I love when people ask the question in my head already. I’ve stuck to pole bean varieties for dry beans, as they are space-savers. A few rows here and there and I have…a pound and half or so of two varieties. So I’d love to hear how much you grow. I like to save the skin from making bacon and use it to line the bottom of the pot. There’s nothing better when it’s cold out. Apropos, for the last two days it has been snowing exactly as much as your new widget. Sparse flakes, drifting down. No more, no less. I wish you more snow than that, Peter. But indeed: I had to pipe up about the skin. Fat-side down, bottom of the bowl. Mmmm. Please tell us more about potted beans and chicken. I do love me some rillettes. Beans, chicken, chicken fat…? I don’t have much to add to the discussion, except: Yum. Cassoulet is indeed a grand, grand dish, however humble in its origins. Hiya Kate. I don’t think it at all surprising that cassoulet wasn’t on your rotation in culinary school. It’s not much in terms of technique at all! Soak beans, then cook in pot in meaty/beany layers. And I think the hoo-hah over “oh but it’s a fancy-schmancy dish” because of the confit is also kind of misleading. How else would you put up meat without refrigeration? Confit is a fabulous way to preserve the stuff, and cassoulet is an ancient recipe, predating modern methods so predating modern ingredients! I am quite sure your ducky dish will be wonderful. Hayden, hah. Yep. 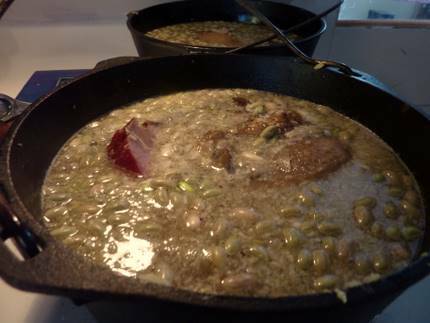 That’s the floating beans in that pot, those green-skinned things, flageolets. (There are three others in there too: Old-Fashioned Soldier, Henderson’s Bush Lima, and the cream-colored beans from the top photo.) It is funny how it’s do-or-die. Kind of like all kinds of traditions, I suppose! Mike, I am sure Micki would love to make it. Really, any long-baked item is wonderful when you’re eating a mostly vegetable diet as it’s, well, celebratory to have the oven on so long! Thanks, Mom. It was really quite tasty…makes me think I should raise geese again! Shannon, I remember when I was about 9 and we had friends visit us from Ireland: let’s just say I was blown away that they didn’t eat peanut butter. And alas I don’t have much of a recipe to share. It’s more of a method than not, from an Elizabeth David book that I have, that I’ve used. But considering how flexible it is you’ll love it no matter what recipe you do use. I have found that the Three Sisters works pretty well with specific kinds of pole beans, Karen, only. In the American south there are beans specifically selected to grow as corn beans: look into the Southern Exposure catalog. 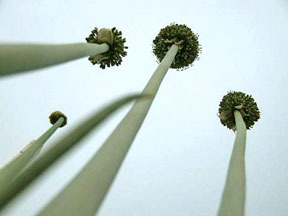 These have been selected for their ability to climb, their living well with less light while growing under the corn, etc. And: my squash grows anywhere, trying to sister with anyone! It IS a whole lot of beans, Stefani, but then again I am a whole lot of crazy! And yeah. Green beans, meh. Paula, well, if you get invited to a dinner serving cassoulet, don’t turn it down. It does make a wonderful special winter dish though if you’re so inclined! Amanda, hah, I feel the same way, esp. about chocolate! I think the sausages are secondary to the beans in the dish but they’re not a bad addition at all…even spicy sausages. And you’re right; whatever you have at hand. Emily, I do love how questions spawn their own posts as an answer. I have one brewing about how big/how much, when, etc. with the beans. In the high season, I guess about half of my (outdoor) beds are bush beans. It makes for a very boring garden, that field of bush beans. And I succession plant them like crazy: beans are my space-filler as you can always use more beans. So. Back of napkin says I use about 1200 s.f. for 25 pounds. Sequentially. Erp: that means about 2000 s.f. in beans! yipes! Sara: Oh yeah I am not superpowergardenwoman. Actually, ever grown lentils? TWO of the things per pod. Who has that kind of time. Peter: Your freezer must be full of little odds and ends. Do you keep it all in your head? I couldn’t.